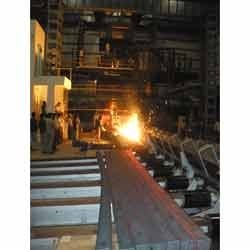 Continuous Casting Machine offered by us is made available in radius of 6-11 and allow superior handling of the casting process where molten metal solidifies into continuous form of strips and billets which can be further worked upon in finishing mills. Featuring automated operations, these machines are made available in two common types of casting options - horizontal and vertical continuous casting. The machines also allow long shapes of simple cross sections like those of square, round and hexagonal rods to be done in form of short, bottomless as well as in water cooled metal mold. Long shapes of simple cross section are cast as square, round, hexagonal rods. We are ISO 9001:2008 certified company, Established in the year 1970, we, "Jay Concast Corporation", have emerged as one of the leading manufacturers, suppliers and exporters of superior quality of Continuos Casting Machine & Products there of like Mould Jacket Assembly, Spray Pipes, Aluminium Template, Spray Nozzles & Copper Mould Tube Reconditioning. All these products are manufactured by us using superior grade raw material, which is procured from the reliable vendors. Products offered by us are in great demand for their perfect finish, longer working life and dimensional accuracy. Owing to these features, all our products have got a huge demand across the global market. We, Jay Concast Corporation are engaged in manufacturing, supplying and exporting a wide range of Casting Solution Components. These products are in great demand in the market for their various features such as finishing, tensile strength and longer working life.